Atlanta's $60,000 green roof project was sponsored by the city's Department of Watershed Management as a tool for improving air quality and for reducing stormwater runoff. Saul Nurseries and ItSaul Natural provided plants and soil for the 3,000-square-foot roofscape. ItSaul Natural, LLC and Saul Nurseries, Inc., are major suppliers of plants and lightweight soil mixes for Southeastern roofscapes. The two companies provide plants and engineered soils for numerous Atlanta area intensive and extensive green roofs, including: Northpark 400, World Congress Center, Atlanta City Hall, Bell South, Hotel Intercontinental, High Museum and Atlantic Station. 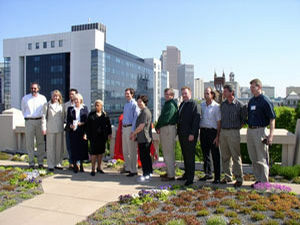 The Saul companies have been involved with green roof systems since their advent in the United States. In 1996, ItSaul Natural supplied the lightweight soil mix for Northpark 400 Office Park green roof plantings. Four-inch caliper maples that were planted as part of this project are thriving and are now 12-inch caliper trees. Street tree plantings installed in 1996 in downtown Atlanta are also flourishing in ItSaul Natural Structural Soil. Saul Nurseries' plants and ItSaul Natural's soil were used in the 3,000-square-foot green roof on the Atlanta City Hall fifth-floor roof, the first municipal project of its kind in the South. The garden is adjacent to the building's fifth-floor cafeteria and serves as an outdoor patio. If you'd like more information about our engineered lightweight soils for rooftops, soils for street-tree plantings, organic composts, or quality planting soils, please call us at 1-800-301-2887.